We all know that mirrors can make a room appear larger but actually they can do much more than that. They can become design elements, bring balance or contrast or make up a focal point in your space. Everything depends on the scale and proportion you use. Here are some ideas to do that. This is a maximal degree of using mirrors in your space, they will reflect the light, catch attention and make your space unique. Such walls are popular in bathrooms and entryways – these are small spaces that get doubled with a mirror wall that reflects light. You may also go for such a wall in a living room or bedroom depending on the effect you want. smoked glass will bring a more modern feel, while antique mirror makes your space exquisite. Mirror closet doors have several advantages at once: they make your space larger, they fill it with light and they allow you seeing yourself while choosing looks. If it’s a seamless piece you’ll get a more minimalist look, there are also cool folding doors to save your space. If it’s a chic framed piece, it will bring a touch of old-world glamour and will add just enough bling to make the room stylish without being gaudy. 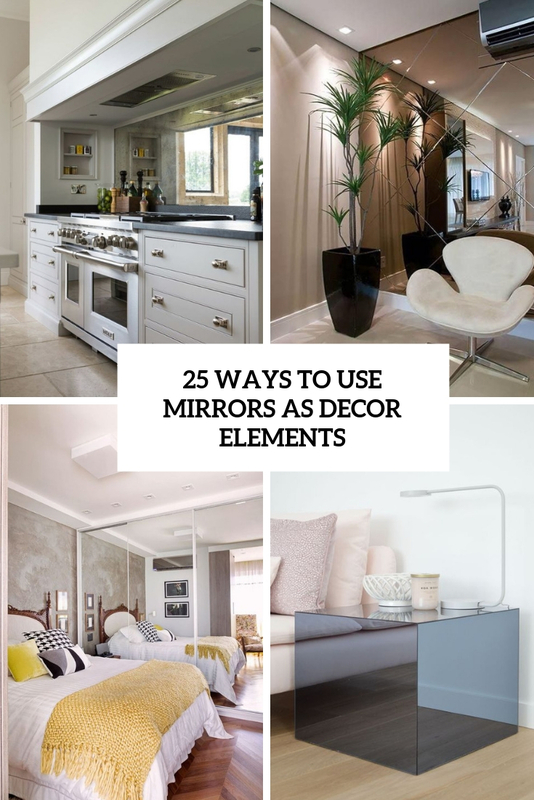 Mirror backsplashes are definitely making a comeback, and you may rock one in any kitchen, from farmhouse to minimalist. Seamless mirror backsplashes are great for minimalist spaces while antique mirror is great for a farmhouse and vintage interiors. Smoked glass is great for minimalist or art decor spaces. There are mirror sideboards, bedside tables, coffee tables, and you can make them of IKEA or other items yourself. Such a item is always an eye-catcher and will make your space more glam-like and more chic at once. Even a mirror tray or a some vases and candle holders will bring a touch of glam to the space.